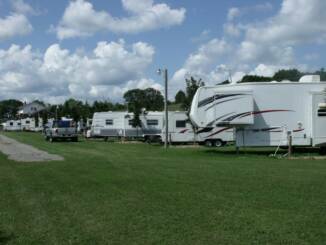 DOCKS available for Transient Campers on a first come booking. (Book early to save a dock.) These rates include self-launch. Picnic tables are provided (one per site) and a fire ring. FACILITIES AVAILABLE: Firewood, Hot Showers, and modern Comfort Station. Office, Store (Ice Cream, Candy), Long Weekend Dances at Recreation Hall. Heated swimming pool open from approximately mid-May/early June until the first Tuesday after the Labour Day Weekend. Two pets are allowed per campsite. Must be on a lease at all times, pet owner is responsible for clean-up. Note that aggressive dog breeds such as pit bulls, rottweilers, bulldogs, etc. are not permitted. Contact resort management in advance if you are unsure if a particular dog breed is permitted within the campground. 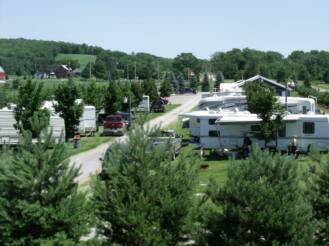 Dreamland Resort assumes no responsibility or liability for any pets within the campground. You may be asked to leave if you do not abide by the pet rules. Dreamland Resort offers full and partial hook-up sites for overnight, weekend, and extended stays.